Which stallion in Iceland is your favorite? The breeding farms will show us offsprings from many of the most well known and spectacular stallions. Þóroddsstaðir – Laugarvatn is á well-known breeding farm. Horses have been bred there for more than half a century. The farm has been owned by the family since 1953. Horses from Þóroddsstaðir – Laugarvatn have been prominent all the time, and every now and then they have been among the best. 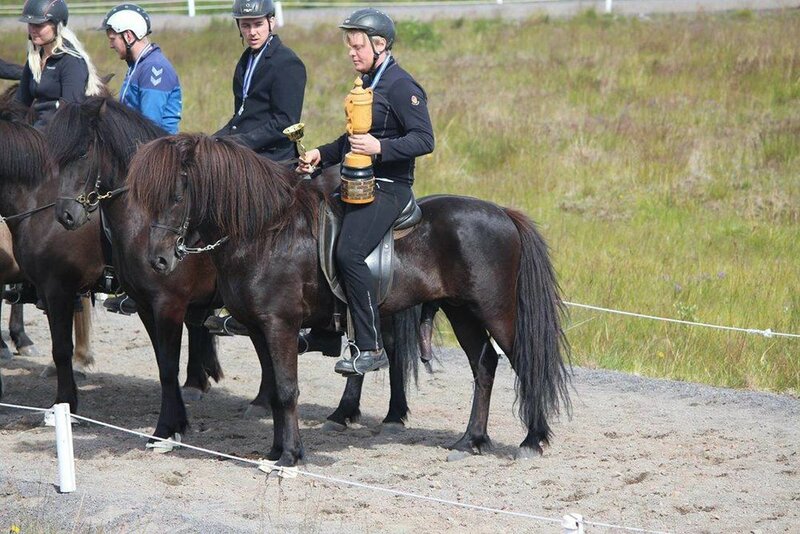 “At Landsmót 2016 we had three horses of highest qualification: Hera, the world champion in 250 m pace (21,41 sec. ), the five years old stallion Trausti (8,30 – 8,86 = 8,64; 9,5 for tölt, 9 for pace and three more 9s) and the four years old filly Fjöður frá Þóroddsstöðum (8,04 – 8,56 = 8, 35; 9 for tölt and 9 for pace.) Many might also know the famous Þóroddur frá Þóroddsstöðum (8,28 – 9,04 = 8,74). And also many mares have been highly judged, some of them very young. Several stallions and breeding mares have got honorary prize for offspring. Our breeding goal is to fulfill our dreams about well–shaped horses with great riding abilities. A special emphasis is on tölt and pace, healthy and right shaped feet, great mane and tale, willingness and good temperament. We like our horses to be easy to break in and easy to ride: Our children had their first and only riding experience on these horses. As grown-ups they have become outstanding riders and trainers. That is also a breeding goal, by the way! One could say that the breeding will soon be taken over by our son Bjarni, and many of the horses are already owned by him. We are looking forward to welcome the Horse Expo guests, and first of all we would like our guests to have a pleasant and educating visit. We also hope it will help us marketing our breeding: The horses of course, and hopefully also our emphasis, mentality andideals in horse breeding. We hope the Expo guests will enjoy the visit. They will see an ordinary family farm, which has been built up in a long time by its own money. The facilities may be better on many horse farms - on the other hand, we believe the horses are extraordinary and likely to be as good as it gets!"